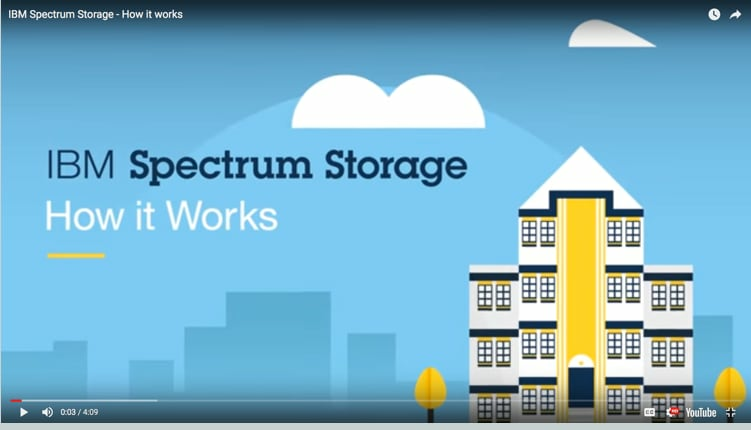 Manage all your data with IBM Spectrum Storage, a comprehensive portfolio of Software- Defined Storage (SDS) solutions. Unify your storage across on-premises and multicloud environments. Respond rapidly to data-intensive imperatives such as analytics and AI. Reduce costs and increase agility. Improve the way you manage, protect and store data with IBM's comprehensive Software-Defined Storage (SDS) portfolio, IBM Spectrum Storage Suite. Deploy an enterprise data storage platform on-premises, on IBM Cloud, or on your private cloud. Enable rapid deployment of the DNA of IBM’s fastest systems on your choice of x86 servers. Reduce downtime, add features, and unify storage from more than 400 storage systems to make block storage more efficient, agile, and cloud-ready. Manage your infrastructure efficiently for software-defined, virtual, physical, file, and object storage. Easily transition to new workloads and infrastructures using predictive analytics, which can reduce storage costs by as much as 50%. Gain unparalleled visibility across your storage environment to help you manage complexity and make cost-saving decisions with this cloud-based service. Combines proven IBM data management leadership with proprietary analytics from IBM Research. Integrate storage in multiple cloud environments quickly and easily. Enables provisioning, monitoring, automating, and orchestrating of IBM block storage in containerized, VMware, and Microsoft PowerShell environments. Make copies of data for backup, recovery, and low-cost archive, and enable new uses of data such as DevOps support. Obtain reliable, efficient data protection and resiliency for software-defined, virtual, physical, and cloud environments. Reduce costs and gain a single point of control. Simplify data recovery and access for virtual machines. Can be deployed in minutes and protects your virtual environment within an hour, either as a standalone solution or when integrated with IBM Spectrum Protect. Make copies available to data consumers when and where they need them, without creating unnecessary copies or leaving unused copies on valuable storage. Deploys as a virtual machine in about 15 minutes.